The seller of today’s Nice Price or Crack Pipe says its Forest Green paint is rare. Let’s see if that exclusivity, and its price, has you shouting run, forest, run! There’s an old maxim that goes ‘the bigger they are, the harder they fall,’ which, when applied economically means that those with the most to lose are the most noteworthy when they lose it. That particular adage could easily have been applied to yesterday’s 2008 Lexus LS600h L since it started out carrying a substantial premium over its shorter and less hybridy brothers, all without much in the way of visual differentiation to set it apart. That resulted in its original $110K selling price plummeting to a mere $20,000 ten years after, and that resulted in a decisive 68-percent Nice Price win. Let’s be fair, Lexus has never been known as a particularly exciting brand. It’s more familiarly envisioned as Toyota’s stuffy dad who always wants to talk about your future when you go over to pick up Toyota for a date. Oh sure, there have been some engaging Lexus models released—even the stuffiest of dads need to cut loose at least once in a while—but there’s never been anything from Toyota’s metaphoric father figure like... oh say, the Porsche Boxster. Oh look, here’s one now just for sake of conversation. How convenient. Actually, we’re having a go at this 2000 Porsche Boxster because it’s claimed to be a rare color, and is seemingly appreciably cheap. That hue is Forest Green and I’d say this base Boxster carries it well. The factory alloys—asymmetrical, I hate that—bring some desired brightness to the game, and look to be free of curb rash. One of those is also free of its center cap. The car’s nose has also been less than lucky, showing signs of peppering in both the bumper and boot lid. Or, maybe it’s cicada season in Texas? Thankfully the ‘fried egg’ lights aren’t totally yellow snowed in. The black top looks to be intact with a reasonably clear rear window for all your 20/20 hindsight. The interior is likewise lightly worn, showing typical cracking and dye loss on the driver’s seat bolster as well as some fading of the carpet between the chairs. There’s a missing piece of door trim on the driver’s door, but the space looks otherwise intact. An aftermarket head unit nestles in the dash right above the shifter for the five-speed gearbox. That five-speed is bolted ahead of a 217-horsepower 2.7-litre flat six. This is the enlarged and revamped M96, which, while free from the issues of cylinder liner cracking and creep that plagued the earlier 2.5 edition. It still lived in the shadow of potential IMS failure. With 135,000 miles on the clock, it’s unlikely that this car’s engine will grenade, however who’s to say what other evils lurk under that conifer grove green paint? Those are compelling testamonials and there’s nothing quite like a Boxster to brighten your day. In fact, the 986 Boxster has become the poor man’s Porsche of choice seeing as almost all the 924s have gone to Audi heaven and the 944s are climbing into the pantheon of un-affordability owing to their age and increasing rarity. That leave the Boxster to carry the torch for us poors. This one carries a $4,900 price, and the seller says that KBB targets it at nearly twice that much. Why so cheap? It’s not a salvage title car, and it doesn’t have any expressed issues, either visual or mechanical. Maybe the seller needs a quick sale due to some extenuating circumstance. Or, maybe it’s a scam. The world is your oyster when it comes to contemplating the possibilities. Or we could just take it at face value and vote on the car and that $4,900 price. In fact, let’s do just that. 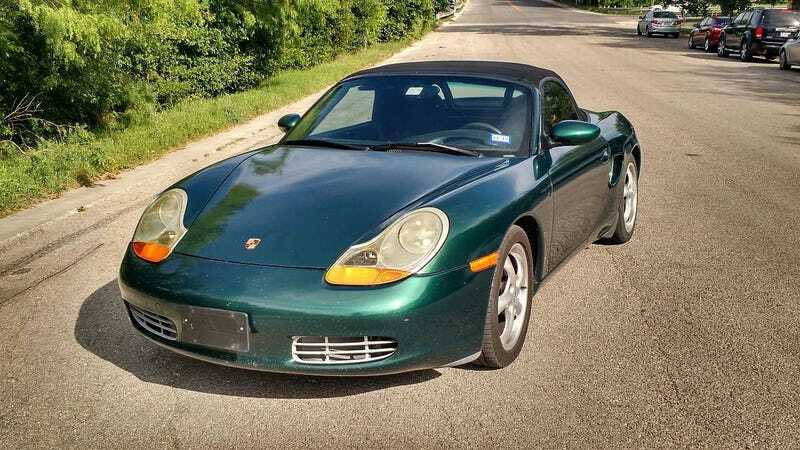 What’s your vote for this 2000 Boxster and that $4,900 price, does that get a Nice Price click? Or, are you going Crack Pipe despite the color and the KBB? At $20,000, Could This 2008 Lexus LS600h L Hybrid Turn You Into A Limousine Liberal?